Roberto Mancini is the new coach of the Italy national team, the Italian Football Federation announced on Monday. The move comes one day after Mancini agreed to terminate his contract as manager of Zenit St Petersburg, which paved the way for him to negotiate his Italy deal. Mancini reportedly signed a two-year deal, though the Italian Football Federation (FIGC) did not give any details about his contract in announcing his appointment. He will be presented at a news conference on Tuesday. The 53-year-old former Manchester City and Inter Milan manager failed to lead Zenit to a Champions League qualification spot for next season. 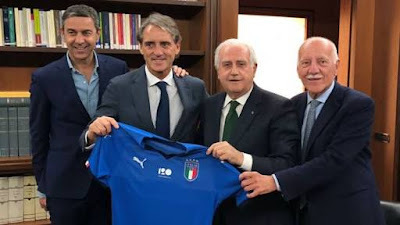 With Italy, Mancini will replace Giampiero Ventura, who was sacked in November after the Azzurri failed to reach the World Cup for the first time in 60 years. As well as Mancini, Carlo Ancelotti, Claudio Ranieri and Chelsea's Antonio Conte had been linked with the position, which had been held by caretaker manager Luigi Di Biagio, the coach of Italy's under-21 side. Mancini, who won 36 caps for Italy as a player, led City to the Premier League title in 2011-12 after three Serie A title wins with Inter. Since leaving the Etihad in 2013 he has managed Galatasaray and Inter again before being appointed Zenit boss last June.